After his years of work considering and promoting alternatives to school, homeschooling in particular, Holt revised his two most famous works to incorporate his new insights. 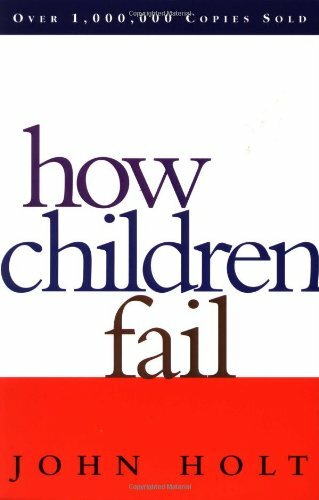 When he revised How Children Fail and How Children Learn Holt left the original text intact, interspersed with his new material (indented and marked with a line running along the left margin). This is to show how Holt himself was learning all the time and how people can be self-correcting. "The only difference between a good student and a bad student, is that the good student is careful not to forget what he studied until after the test..."
"...[the] alternative — I can see no other — is to have schools and classrooms in which each child in his own way can satisfy his curiosity, develop his abilities and talents, pursue his interests, and from the adults and older children around him get a glimpse of the great variety and richness of life. In short, the school should be a great smorgasbord of intellectual, artistic, creative, and athletic activities, from which each child could take whatever he wanted, and as much as he wanted, or as little. When Anna was in the sixth grade, the year after she was in my class, I mentioned this idea to her. After describing very sketchily how such a school might be run, and what the children might do, I said, "Tell me, what do you think of it? Do you think it would work? Do you think the kids would learn anything?" She said, with utmost conviction, "Oh yes, it would be wonderful!" She was silent for a minute or tow, perhaps remembering her own generally unhappy schooling. Then she said thoughtfully, "You know, kids really like to learn; we just don't like being pushed around." No, they don't; and we should be grateful for that. So let's stop pushing them around, and give them a chance. Since I wrote this, I have stopped believing that "schools," however organized, are the proper, or only, or best places for this. As I wrote in Instead of Education and Teach Your Own, except in very rare circumstances the idea of special learning places where nothing but learning happens no longer seem to me to make any sense at all. The proper place and best place for children to learn whatever they need or want to know is the place where until very recently almost all children learned it - in the world itself, in the mainstream of adult life. If we put in every community, as we should (perhaps in former school buildings), resource and activity centers, citizens' clubs, full of spaces for many kinds of things to happen- libraries, music rooms, theaters, sports facilities, workshops, meeting rooms - these should be open to and used by young and old together. We made a terrible mistake when (with the best of intentions) we separated children from adults and learning from the rest of life, and one of our most urgent tasks is to take down the barriers we have put between them and let them come back together..."